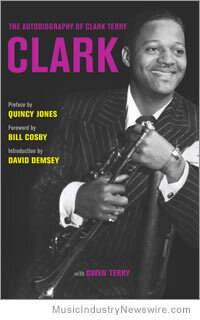 MuseWire COLUMN: Storytellers are to be cherished and Clark Terry should be on a pedestal for his thoroughly entertaining autobiography. Brimming with life, love, music, and great characters, this book is as much a history of the twentieth century as it is a history of his ninety years (and counting!). What happens next is even more outrageous but I’ll let you discover all the wild scenes for yourself. I got out and walked away hoping that they had accepted what I’d done. When the instructor blew the whistle, I glanced back and saw the next guy jump in. No one called me back, so I walked away calmly, while my insides were jumping for joy. A few weeks later I got an unwelcome letter from home. That type of thing happens a lot and it rather charmingly propels you forward. Kicked out of the house before his thirteenth birthday, Terry learned how to make his way through life the hard way. There was scrapin’ and scrappin’ galore as he struggled to survive while always returning to music, whether playing with others or spending hours and hours practicing. Until there were sores. Until there was blood. Billy met me at Grand Central Station. I was overwhelmed by all the people. All colors, foreign accents, moving, pushing, talking. Billy was grinning like crazy, telling me all about the things he had planned for us. I didn’t hear much of what he was saying while we were walking to the subway, ’cause I was totally wowed! Tall buildings, a sea of yellow taxi cabs, restaurants, stores, and honking horns. While the book is a story of a man’s journey through life, love, and music, it is also about racism. The tales of indignities and violence are numerous and incendiary. Some of them resulted in flight; some in calls for first aid; some were deadly. On the other hand, the colors of people are noted frequently by Terry, almost always in a descriptive and friendly manner. This guy or that gal might be the “color of nutmeg,” “Dark-skinned,” “Medium-brown skinned,” “Olive complexion,” “caramel-skinned,” “light complexion,” “color of bittersweet chocolate,” and so on. At one point, he talks about joining the colored musicians’ union: “The whites had theirs and we had ours, but we all read the same black notes on white manuscript.” It’s hard to top a sentence like that. I have nearly a page of notes leading to cool quotes in the book. Like when Terry mentions that “Jazz saved my sanity. Which made me love it even more.” Or when he is talking about a trumpet player who was waiting tables “because it paid more money than gigging.” Some things never change. It was the greatest feeling in the world to think that I had something to do with the careers of my students. The greatest feeling. I loved the awards that came from here and there, but the thing I loved most was to see those young people grow. Watch their dreams come true. During his easygoing renditions, there was a soul-stirring feeling. His four-four rhythm swayed a head-nodding and ear-bending groove, an easy foot-tapping bounce. Then during his up-tempo renditions he created a finger-popping force that made you move. In the back of the book is a nineteen-page discography compiled by Tom Lord, editor of the Jazz Discography Online. It lists 371 releases. After reading Terry’s stories, I now want to hear every single one of them. Article is Copr. © 2011 by John Scott G, and originally published on MusicIndustryNewswire-dot-com before the site was revamped as MuseWire.com in March 2015 – all commercial rights reserved. Disclosure: no fee or other consideration was provided to JSG, this site or its publisher, by the book author, publisher or agent(s).